The lovely light at the Köln Hauptbahnhof again. A bit of a nod to sevilduvarci and her faceless series. Post processing - duplicate layer with multiply blending mode, reduced in opacity; adjustment layer for black and white conversion; color balance layer to add sepia-ish tone (+10 red, +10 yellow); slight rotate and crop; slight dodge on pants legs; sharpen, resize, small border. What a scene. Peaceful. Simply waiting. i really love this faceless expression of casually waiting. my mind almost fills in the rest of the picture: a business man, middle aged, clean shaven with mid length peppery hair, covered mostly by his wallstreet-esque fedora, copy of german equivalent of NY times obscuring most of his face. waiting patiently as he has done for years. the train comes without fail. Excellent, it's got a really lonlely feel. Love your work. I just love how your subject is in focus and has great clarity (especially with the use of black and white). Wonderful use of DOF and natural lighting. Your stock just went WAY up in my book - and it was already pretty high! P.S. Did I mention I love this? Deb, great B&W. Very nice composition and DOF. Well, looky there, Deb - ya broke 6. :) Told ya it was a cool shot! Had a sneaking suspicion this might be you. :) Great shot, Deb! Love it! It's funny, Sevil guessed it was you. . .and I might have guessed it was her :) But yes, it also is wonderfully you! wow, love this for some odd reason. Very deep, makes me really wonder about this person. We've really got to stop meeting like this...every time I review the results and order by my votes, you're always right there! Excellent photo and dare I say underrated with a 6+ score! Deb, very nice shot and very nice score. The B&W with the slight sepia tone works very well here. Good job. i'm very much honoured by your nod especially in a free study! All that much nicer because the shoes make this image from no particular time. It could as easily be the 30s as the 2000s. It has hints of a story too. Loved this one, Deb! It was in my personal top five! : ) Well done! One of the best, should have scored much higher. Rather disappointed in the placement and seeing a lack of favorites on this. Congrats - this is superb! Superb! My first favorite of this challenge. Nice composition, good use of the tracks to create depth. I like how the subject is off to the side and not inthe center. it makes this image a good one. The shallow DOF of the rails beyond the station is very nice. It looks really cool but still brings attention back to where it needs to be, at the real meat and potatoes of the photo. I really enjoyed this one...top notch stuff! Super image, very "jj". One thing bugging me is the soft border on the right. Overall one of the best of this challenge. Man, I want to give you a 10 on this, because I love it. So much mystery here. An unusual candid. Good eye for composition. The elements work together nicely. Conversion to BW is excellent - would not have been nearly as effective in color. I love having something left to my imagination. Great image. I like the familiarity this has. You stopped and took a photo of something we've all seen. You made it artful with the arch, train and perfect focus and DOF. Nice job. mmm. i like this. 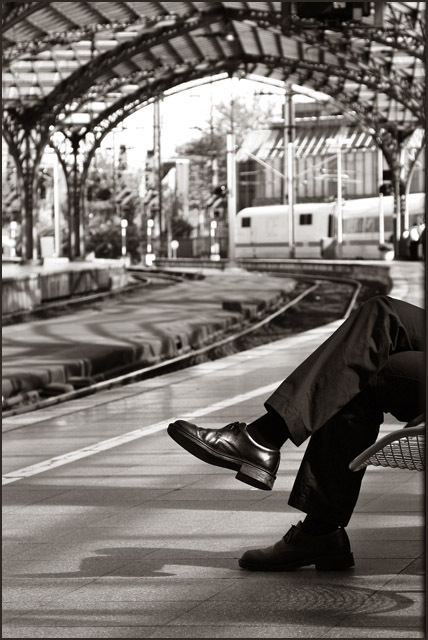 man waiting for hes train. shiny shoes. trains. beuty. Proudly hosted by Sargasso Networks. Current Server Time: 04/22/2019 12:38:59 AM EDT.